Get the beef out of the refrigerator about half an hour before roasting it. 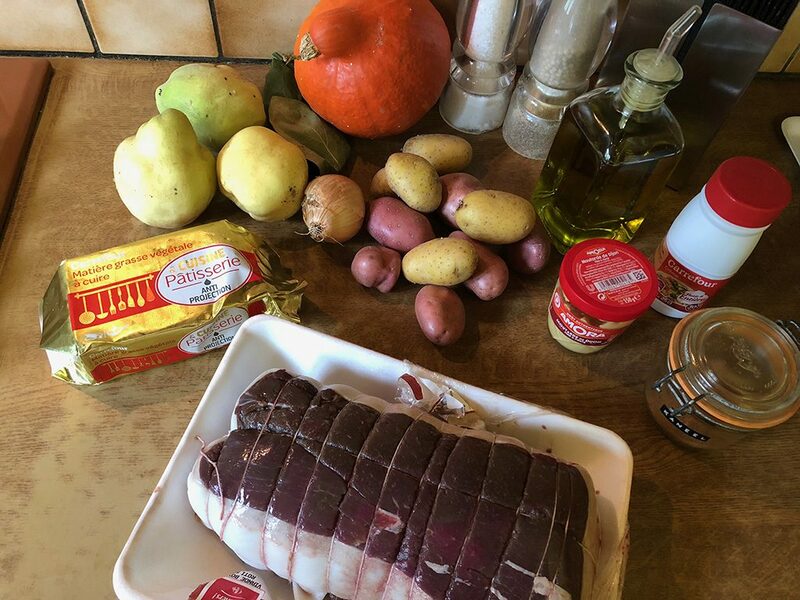 Meanwhile CREATE a pumpkin puree and the stewed quinces. PRE-HEAT the oven to 180 degrees Celsius or 350 degrees Fahrenheit. PEEL the pumpkin, remove the seeds with a spoon and divide into chunks. ADD the pumpkin to a pan and fill it with water. Bring to a boil and cook the pumpkin until it’s soft, the exact time depends on the size of the pumpkin chunks. PEEL and finely chop the onion. PEEL the quinces, remove the core and divide into wedges. HEAT a knob of butter in a medium-sized skillet and cook the quince wedges for a few minutes. ADD finely chopped onion and sauté a few minutes more and pour in a small layer of water. Put the lid on and let it simmer for about 20 minutes. If you want to serve some potatoes with this dish, you can chop them in chunks and divide them over an oven tray. DRIZZLE with olive oil, pepper and salt and roast them in the oven for about 20 minutes. Time depends on the size of the potato chunks. SEASON the beef with pepper, salt and a bit of ground cinnamon. COAT the outside with a thin layer of mustard. HEAT a dash of olive oil along with a knob of butter in a large skillet and cook the meat a few minutes on all sides. 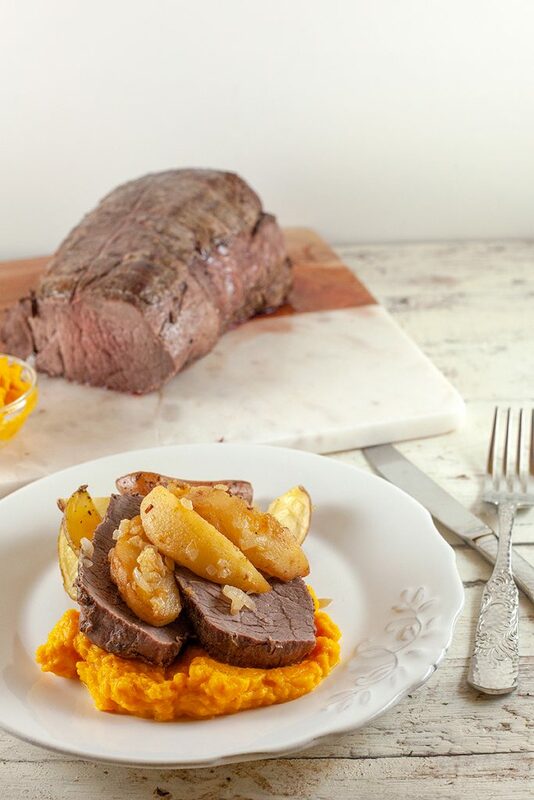 TRANSFER the beef to an oven dish and ROAST the beef in the oven for about 20 minutes. The exact time depends on your oven and the thickness of the beef. The temperature should be 53 degrees Celsius or 127 degrees Fahrenheit. TRANSFER the meat to a plate as soon as the meat is beautifully rose on the inside. WRAP with tin foil and let it rest for about 10 minutes. Meanwhile FINISH the pumpkin puree. DRAIN the pumpkin chunks and create a puree using an immersion blender or press them through a fine sieve. SEASON with pepper, salt, a pinch of ground cinnamon and a dash of cream. 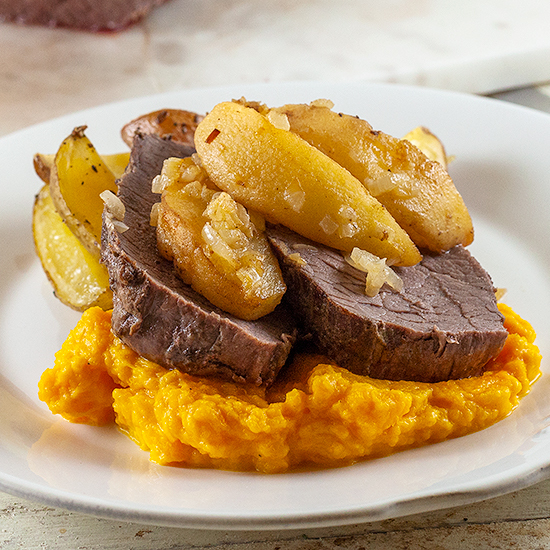 DIVIDE the meat into slices with a sharp knife and SERVE with pumpkin puree, soft quince wedges and oven-roasted potatoes. 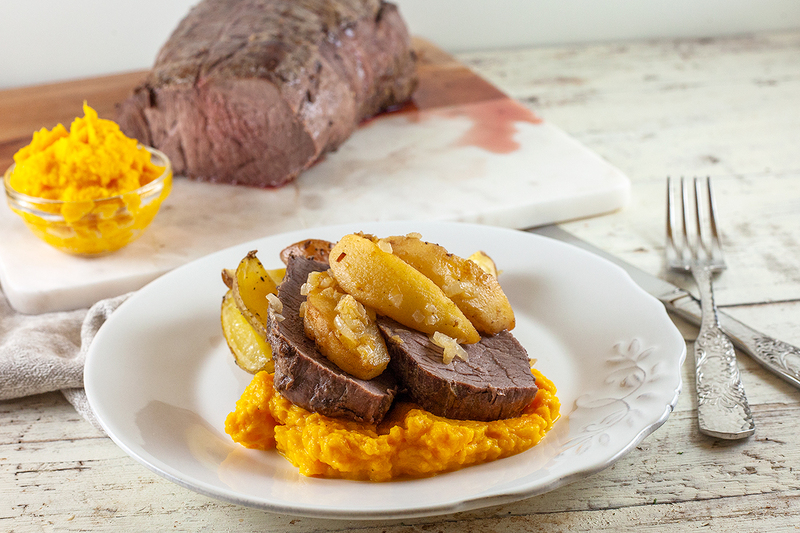 There’s no need for any sauce because the puree and quince are already ‘smooth’. If you do want some extra sauce, you can add some extra butter and water to the skillet of the meat for a simple meat sauce. Enjoy!